It seems like every year we get closer and closer to Halloween, before anyone has decided what they want to dress up like. I found myself, the day before Halloween, scheming on how to convince the children to be easy dress ups. No trips to the dreaded Wal-mart to scrounge around oversized and picked over outfits. I asked Tom Builder for a little support to encourage the kids towards my simple but wonderfully cheap and quick costumes: one mummy a la Tee-Pee, and on Tom Builder’s recommendation, one sheeted ghost. 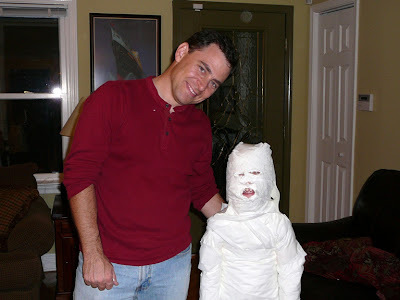 Grace went for the Mummy idea, and Jack liked the thought of being a ghost. Faith, took on the Hand-me-down costume with style, inheriting Jack’s Gorilla suit. Somehow the ghost managed to escape my camera (don’t they usually? ), but I caught the other two before we headed out for an all out assault on the housing industry. In about three houses, Faith had caught on very clearly as to what a doorbell ring could bring. It didn’t matter how many stairs lay before that door, she would earn the prize! The candy booty in this family just got larger with the addition of a third qualified trick-or-treater. And in the tradition of my Father, there will be many “Tax Time” payouts to parents in each treaters future. I like to think of it as teaching our kids the importance of Tax Cuts. They look adorable. Ken looks like he is enjoying the fact that he has added another recruit to collect the neighborhood goodies. In a couple of years he will have quadruple the amount coming home. Just one caveat. The dentist may have the last laugh.